It’s every parent’s worst nightmare: the call that comes in the middle of the night. When Kat Jenkins awakens to the police on her doorstep, her greatest fear is realized. Her nine-year-old son, Ethan, is missing—vanished from the cabin where he’d been on an overnight field trip with his class. Shocked and distraught, Kat rushes to the campground where he was last seen. But she’s too late; the authorities have returned from their search empty-handed after losing Ethan’s trail in the mountain forest. Another mother from the school, Stef Huntington, seems like she has it all: money, prominence in the community, a popular son and a loving husband. She hardly knows Kat, except for the vicious gossip that swirls around Kat’s traumatic past. But as the police investigation unfolds, Ethan’s disappearance will have earth-shattering consequences in Stef’s own life—and the paths of these two mothers are about to cross in ways no one could have anticipated. Racing against the clock, their desperate search for answers begins—one where the greatest danger could lie behind the everyday smiles of those they trust the most. 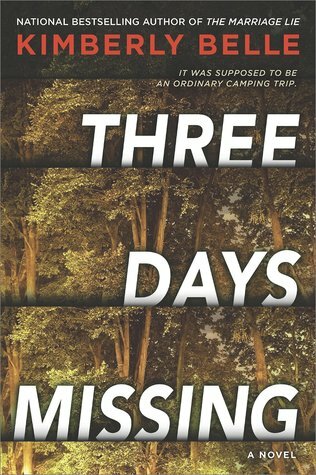 This was the first book I have read by Kimberly Belle and I have heard so much praise for Three Days Missing. After picking up my copy at a local bookstore I was excited to begin and I knew I would not be disappointed. Kimberly Belle has a way with writing that draws you in and captures your attention throughout the entire book. I was on the edge of my seat and I was flying through the chapters, eager to see what would happen next. Three Days Missing was a fast-paced thriller that leaves you wanting more. I enjoyed the who done it vibe to the story. There were a few times when I thought I knew who might be responsible and behind young Ethan’s disappearance, but I was wrong again and again. I love when a story keeps you guessing, and makes you doubt everyone involved. Even those closest to you are under suspicions of being responsible. Who can you trust, if even those closest to you in your everyday life cannot be trusted? Those who know you daily life, your ups and downs, your innermost thoughts and secrets? Three Days Missing is full of characters who are diverse, complicated, and have their own fair share of secrets. Full of shocking lies, twists, turns, betrayals, deceptions and lies, this book will rock you to the very shocking end! I loved this book and I hope you do too! A website to share my literary adventure - including reviews, weekly memes, and lots of fun. A Blog About Books. And Cats.